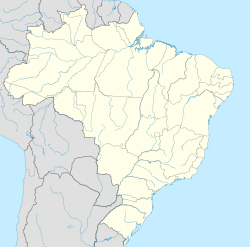 São Gonçalo (Portuguese pronunciation: [sɐ̃w ɡõˈsalu]) is a municipality located in the Brazilian state of Rio de Janeiro. It is on northeastern Guanabara Bay in the Rio de Janeiro Metropolitan Area. It is located at 22° 49′ 37″ S, 43° 3′ 14″ W at an altitude of 19 metres (62 feet) above sea level. Its population in 2009 is 1,010,212 inhabitants, being the second most populous city in the state after the capital. The population of São Gonçalo was 973,372 in 2006, and its area is 249 square kilometres (96 square miles). It is the second most populous city of the state, after the capital Rio de Janeiro city. Until recently it was the third largest, when Mesquita was split off as its own city from Nova Iguaçu. The municipality contains 4% of the 1,936 hectares (4,780 acres) Guanabara Ecological Station, created in 2006. It contains part of the Central Rio de Janeiro Atlantic Forest Mosaic of conservation units, created in 2006. The type of climate of São Gonçalo is Atlantic tropical, with rainy summers and relatively dry winters. Temperatures vary throughout the year on and can have a maximum up to 40 °C (104 °F) in summer, and a minimum close to 10 °C (50 °F) during winter. Generally, temperatures range between the maximum of 25 to 35 °C (77 to 95 °F) and minimum 14 to 24 °C (57 to 75 °F). But for the most part of the year, i.e. from May to October, the temperature is milder because the climate is drier and less hot. São Gonçalo has a high index of population growth. The city has an estimated population of 1,049,826 (2017 estimate). According to the 2012 Census, the racial makeup of São Gonçalo includes: Whites (22.7%), Brown (54.1%), black or African (20.2%), two or more races (3%) and Asian (0.02%). Non-Brazilian population by any race was 3.5% (Paraguayan 2%, Bolivian 1%, Chinese 0.5%), a high index compared to cities in Brazil. According to the same Census, São Gonçalo has a high index of poverty. 31.5% of the population were living in the line of poverty in 2012, down from the 81% in 1990. People considered "Class A" were just 4.7%. The Rio de Janeiro State Teachers Training College (FFP-UERJ)stands out in the city. It is the largest teachers' college in Rio de Janeiro state offering advanced training of senior staff. The campus offers undergraduate courses in Biological Sciences, History, Geography, Letters: Portuguese / Literatures, Letters: Portuguese / English, Mathematics and Pedagogy.More graduates from FFP pass state tests than any other teaching institution in Brazil. Its importance is magnified when one analyzes what an advanced training pole of senior staff from the UERJ is. Its students are mostly residents from Sao Goncalo, but many come from Niterói, Rio de Janeiro, Itaboraí, and municipalities of the Baixada Fluminense region, among others. For many years, students of this campus demanding the implementation of a bus intercampi free to link to the Saint Mary UERJ Maracanã. The Polo Open University of Brazil has courses in the Consortium of Universities CEDERJ UFF (Computer Science), UFRJ (Chemistry) and UFRRJ (Administration and Tourism). São Gonçalo has the following hospitals: Hospital Estadual Alberto Torres; Eye Hospital Niteroi; Hospital Luiz Palmier; Hospital Adam Pereira Nunes; Barone Hospital de Medeiros; Silveira Hospital Infantil Darcy Vargas, Hospital Pads, Hospital Santa Maria. São Gonçalo suffers constantly from poor garbage collection services, and it is not uncommon for litter to accumulate on the streets. In December 2008, workers responsible for cleaning the streets went on strike, severely compromising public sanitation. In January 2011, garbage collection ceased for more than a week in some parts of the city. Now the problem is solved. São Gonçalo was the birthplace of Zélio Fernandino de Moraes, founder of the Umbanda Branca religious sect. ^ "Greve de garis espalha mais de 800 toneladas de lixo pelas ruas de São Gonçalo". Archived from the original on 11 July 2011. Retrieved 24 February 2011. ^ "Moradores de São Gonçalo ainda sofrem com falta de coleta de lixo". Archived from the original on 6 July 2011. Retrieved 24 February 2011.